Chicago | Reuters — U.S. soybean futures dropped to contract lows on Wednesday and the most active contract closed at the lowest in nearly 10 years as an escalating trade war with China stoked worries about long-term export demand from the world’s top importer of the oilseed. Favourable crop weather in the U.S. Midwest weighed on soybeans and corn, which also hit contract lows, on expectations for bumper harvests this season. Wheat slumped for a third straight day, following corn and soy lower and as stiff global competition dented demand for U.S. shipments. Worries about rising trade tensions with China hung over markets in general after Washington detailed products to be covered by a 10 per cent tariff on an extra $200 billion worth of Chinese imports (all figures US$). China has vowed to strike back. The hardening standoff has put particular pressure on soybeans, the most valuable U.S. agricultural export to China, which bought more than $12 billion of U.S. soybeans last year. “In the short run, China’s probably not going to be able to take too much of their business away from the U.S., and what they do likely will get displaced. But in the long run, this is giving them more incentive to develop other channels,” said Ted Seifried, analyst with Zaner Ag Hedge. 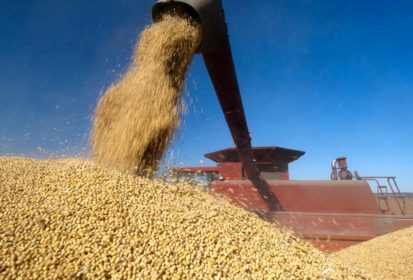 Chicago Board of Trade August soybean futures fell 22-3/4 cents, or 2.7 per cent, to $8.33 a bushel, after notching a contract low of $8.31-3/4. New-crop November soybeans fell 23-1/4 cents to $8.48-1/4 a bushel, the lowest closing price for a most-active contract since March 2009.
CBOT September corn touched a contract low of $3.39-3/4 a bushel and ended down 7-3/4 cents, or 2.2 per cent, at $3.40 a bushel. Forecasts for rain and cooler Midwest temperatures in the week ahead boosted prospects for a bumper corn harvest and bolstered expectations that the U.S. Department of Agriculture (USDA) will raise its production forecast in a monthly crop report on Thursday. CBOT September wheat futures fell 20-1/4 cents, or 4.1 per cent, to $4.71-3/4 a bushel. Generally favourable growing conditions for U.S. spring wheat anchored wheat prices, along with easing concern about global supplies. France’s farm office FranceAgriMer said on Tuesday the country had bigger wheat stocks than expected. — Karl Plume reports on agriculture and commodities for Reuters from Chicago; additional reporting by Gus Trompiz in Paris and Naveen Thukral in Singapore.